Four J D Neuhaus EH 60 air operated monorail hoists supplied for offshore BOP handling have completed 12 months satisfactory operation to customer requirements and have also successfully passed their first annual inspection. These hoists were supplied and initially mounted in Norway by Westcon Løfteteknikk AS (WCL) at the Westcon yard, and were designated for eventual location on the Seadrill West Epsilon rig, which is classified as DnV, + 1A1 self-elevating mobile offshore unit. The hoists, each providing a 60 ton lift capacity, were required for the synchronized handling during both pre and post drilling operations of a new 120 ton BOP unit supplied to the rig. Each hoist was fitted with load eyes instead of hooks, and provided a total lift height of 17.4 meters with four chain falls. They also provide a 0.5 meter/min lifting speed under full load, with a designed trolley speed of 12 meter/min for horizontal travel movements. Each hoist was also equipped with a pendant controller to accommodate synchronized operation of the lift, lower and travel movements for all hoists. The hoists were required to be suitable for use in an Ex area with ATEX zone 1 with gasses IIB, together with full offshore execution for weather protection etc. Built-in safety features for the JDN products include an emergency air supply shut-off valve in each pendant controller, together with fail-safe brakes to hold a load safely if the air supply is interrupted. Both anti-climb and anti-drop devices are also incorporated. 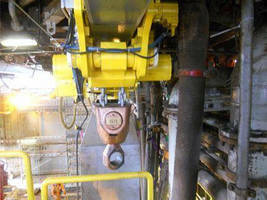 The latest JDN emergency lowering device was also specified for the individual hoists. This equipment facilitates, in the event of an interruption or total failure in the air supply, the safe lowering of a suspended load under controlled speed to a safe grounding position. This is achieved by the installation of a reserve air supply reservoir on each hoist. These are maintained at full air pressure throughout normal hoist operations, and contain a sufficient air supply to effect a safe load lowering operation following the loss of mains air. These safety devices ensure compliance with forthcoming Norsok regulations. The EH 60 hoists supplied form part of an extended range of low air consumption monorail hoists manufactured by J D Neuhaus. This product range covers individual lift capacities ranging from 10 to 115 tons, with optional air or hydraulic operation being available. All hoists are tested with 25% overload with appropriate certification. Their compact, low-headroom design is conducive to operation within confined or restricted spaces, with hoists being operated individually or combined in tandem or parallel running on overhead beams to suit a wide range of operating requirements. Westcon Løfteteknikk AS is an authorized Norwegian sole importer of J D Neuhaus lifting and handling equipment. Worldwide contact details for J D Neuhaus can be seen at the end of this press release. J D Neuhaus are a privately-owned company, founded in 1745, and for over 265 years they have been using their expertise and experience to manufacture the highest quality hoists, winches and cranes. Their products offer solutions to almost every material handling problem irrespective of the driving medium: from air, manual and hydraulic hoists up to complete crane installations with explosion proofness. J D Neuhaus are represented in more than 90 countries and over 70 branches Worldwide.